FBI Director Christopher Wray testifies on Capitol Hill on June 18. The president has been trying to correct course since coming under intense criticism for appearing to accept Russian President Vladimir Putin's denials over the U.S. intelligence community's assessment of Moscow's election interference. Wray, speaking at a national security forum in Aspen, Colo., said the FBI has not seen Russia try to target specific election infrastructure yet this year like it did in 2016, but he said Moscow's ongoing operations are "very active and we could just be a moment away from it going to the next level." The way the Russians work, he said, is they identify a divisive issue in the U.S. and then use overt and covert means, including fake news and propaganda, to "basically sow divisiveness, spin people up on both sides of an issue and watch us go after each other." 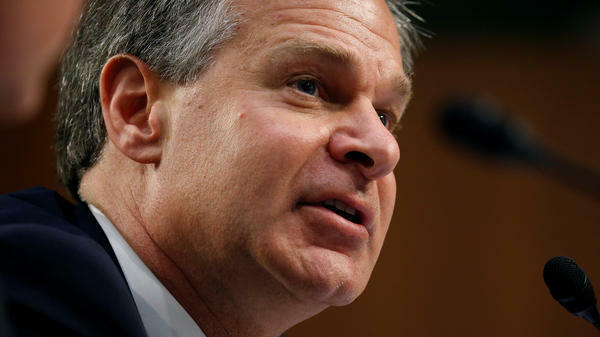 Wray also brushed aside an offer Putin raised to Trump at their recent summit in Helsinki, to allow FBI agents sit in on Russian law enforcement's questioning of Russian suspects who are of interest to U.S. authorities. "I never want to say never about anything, but it's certainly not high on our list of investigative techniques," Wray said. Asked about the other half of Putin's offer — to have Russian law enforcement sit in on FBI interrogations of Americans who are of interest to Moscow — Wray quipped: "That's probably even lower on our list of investigative techniques." Wray repeatedly sidestepped questions about Trump's attacks on the FBI, but he did push back — again — against the allegations that special counsel Robert Mueller's investigation into Russian interference in the 2016 election is a "witch hunt." "I do not believe special counsel Mueller is on a witch hunt. I think it's a professional investigation conducted by a man I've known to be a straight shooter," he said.